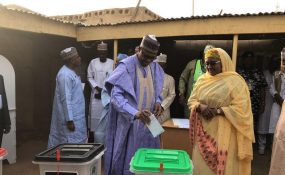 Nigerian President Muhammadu Buhari votes in the 2019 election. What does Senegal have in common with Nigeria regarding elections? Very few, if any at all. The former is regarded as a stable democracy, the latter is not. But experts say Abuja and Dakar can learn from each other. Senegal is the African continent's poster child on matters related to democratic elections. About 6.5 million people of the country's 15.9 million inhabitants voted peacefully in one of Africa's most stable countries, with only five candidates running for the presidency. On the contrary, Senegal's West African neighbor Nigeria also went to the polls a day earlier, with 72.8 million of its 191 million people. And the elections in Africa's most populous nation were far from peaceful. So far, 39 people were killed in the violence linked to the vote, election offices were burnt down and ballot papers destroyed. These two economic power houses in the west African sub-region couldn't be any different. Nigeria's incumbent President Muhammadu Buhari has already been declared winner of last Saturday's presidential electionwith his All Progressive Congress (APC) party sweeping 19 of the 36 states. The opposition People's Democratic Party (PDP) was victorious in 17 states and in the capital, Abuja, according to the electoral body INEC. Buhari's main challenger Atiku Abubakar rejected the result of what he described as a "sham elections." He said he would be "challenging it in court." Unlike Nigeria, Senegal's incumbent President Macky Sall, who is seeking re-election for a second final term, has claimed victory by winning 13 out of 14 regions with "at least 57 per cent" of the vote. Just hours after, opposition politicians said a second round would be required since there was no clear victor. "Democracy in Nigeria is emerging," said Olayinka Ajala, conflict analyst and associate lecturer in International Relations at the University of York. According to the Ajala, Nigeria is carving out a new path to democracy despite its enormous challenges. "The number of political parties in this election shows that a lot of people are embracing democracy. Also the senate president (Bukola Saraki) just lost his seat as a result of the elections: Before it was very difficult to have people of such political caliber to lose their seats. That is another indication," he added. Ajala believes that Nigeria is on the right path. While Nigeria has recorded a number of coups and civil unrest since independence from Britain, Senegal has not experienced a disruption of its political system since independence from France in 1960. President Sall had been favoured to win the election on the back of strong economic growth. But critics, however, accused him of sidelining political opponents. His strongest rivals, Khalifa Sall [bears no relation to the president] and former President Abdoulaye Wade were banned from running in the presidential race after being accused of corruption. Both have dismissed the charges as politically motivated. Hawa Ba, the Senegal country officer for Open Society Initiative West Africa (OSIWA) believes that this is going to have an effect on the reputation of Senegal: "Even though those candidates were prevented from running because of the fact that there were court cases against them, I can say that it will definitely affect the image of Senegal as a democratic country." Also, the fairness of the election could be questioned. Both countries reflected a rise of democratic awareness in Africa. According to Ba, Senegalese strongly believe in elections. "People trust state institutions in running free and fair elections," she said in a DW interview. "They believe in complete and total competition and see the election system as a way for every single citizen to express his or her choice. The voter card is sacred for us. The election voting is considered a fundamental right," she added. The rights activist said she saw people going to three different polling stations to look for their names in voter registers: "That is resilience. And there is this belief that my voice counts, in choosing the president, in choosing a mayor, or in choosing a member of parliament." That is why the election went peacefully. Ba claimed 98 per cent of polling stations opened on time. "In about almost 90 per cent of polling stations, all voting materials were in place and voting operation proceeded," she said. On the Economist Intelligence Unit's 2018 Democracy Index, Senegal ranked 73 out of 167 countries. Nigeria was placed 108 in the index. "This is the sixth election since military rule ended in 1999. And that is one of the reasons why Nigeria is very low on the Democracy Index," says Ajala. "Democracy entails a lot of things, like the rule of law. But evidence is that the country has been able to hold elections every four years since 1999. Key thing is that the two candidates have gone neck and neck and this is a clear indication that the election accurately reflected the will of the people." Ajala did not expect the opposition in Nigeria to congratulate the winner. "But I do not think it is going to result in violence", he said. He is sure that the opposition is going to contest the result. "Since 1999 the opposition always contested the results of the elections. It's a normal thing. They will contest the results and there is a legal process in place where they can seek redress in the courts. So I'm not worried, this is a trend every four years." Rights activist Ba believes that Senegal and Nigeria can learn from each other's elections to boost their democracies. "The Senegalese electoral management does not communicate much. They don't use new media or technology to communicate like INEC in Nigeria does", she said. "INEC has a website. They have Twitter. They have Facebook, they communicate a lot." In return, Ba believes Senegal could teach Nigeria the values of peaceful elections. "Senegalese are very passionate about politics and elections, but in a sense that elections are not something that divides us. It's something that should be used to show that the country is one." In elections, it's not about ethnic groups, Ba underlines. "It's not about the region. It's not about religious belonging. But what matters most is the country as one, despite our differences," she said.